Though Edmund Hillary's name is synonymous with summiting Everest, there was someone else he couldn't have done it without. 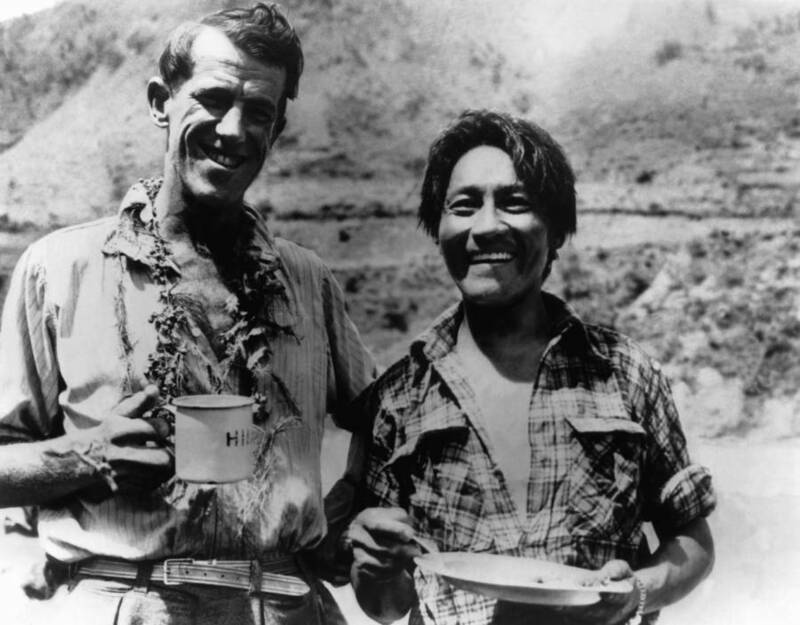 Keystone-France/Gamma-Keystone via Getty Images New Zealander climber Edmund Hillary and the Sherpa Tenzing Norgay drinking a cup of tea in the middle of the Himalayas just after reaching the summit of Mount Everest. As climbers near the summit of Mount Everest, they encounter the Hillary Step (or perhaps not anymore thanks to a 2015 earthquake), so named for the first man to scale it. In fact, all around there are reminders of Sir Edmund Hillary, including several Himalayan peaks named after him, as well as bits of geology and camps across Mount Everest. However, what climbers didn’t see until 2013 was any indication that Hillary had any help that fateful May day in 1953. But indeed, Hillary was not alone. There were roughly 400 other people close behind him as he trekked up the mountain, but one was with him the whole time – a man he couldn’t have done it without. Tenzing Norgay was born Namgyal Wangdi, most likely in 1914 in either Nepal or Tibet. Despite conflicting accounts of his early years, all agree he took his first breath near the Himalayas – the area that would one day make him famous for leading Hillary to its highest peak. In his youth, his father took him to see a Lama at the Rongbuk Monastery, after which he changed his name to Tenzing Norgay. That translates to “wealthy fortunate follower of religion.” This was something his father hoped he’d become, but ultimately Norgay chose another path. Norgay spent his early childhood in Kharta, Tibet as the 11th of 13 children. As a young boy he’d run away from home repeatedly, each time attempting to go off on a mountaineering adventure in Kathmandu, Nepal or Darjeeling, India. After sending him to a monastery to try his hand at being a monk, his parents sent him to Nepal to work for a sherpa family in Khumbu. 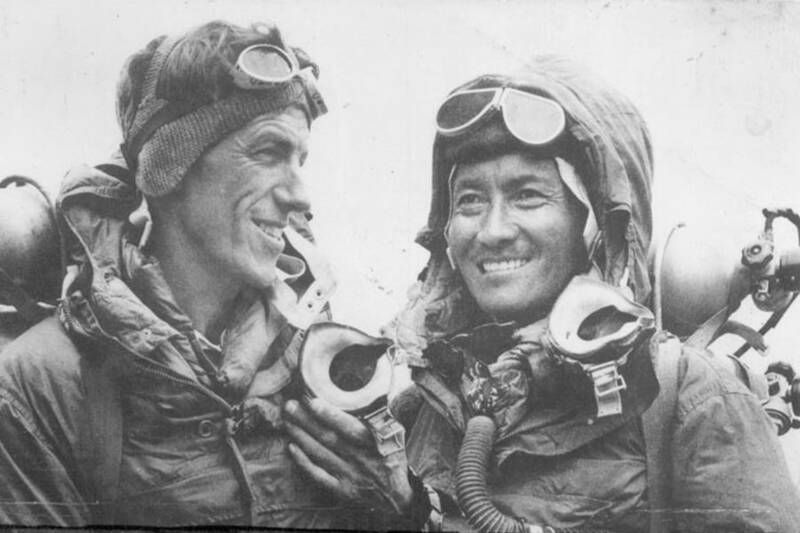 Wikimedia CommonsEdmund Hillary and Tenzing Norgay suited up for their climb. As a sherpa, a love of mountaineering was instilled in him from an early age. Khumba lies in the shadow of Everest, which the locals refer to as Chomolungma. Norgay grew up revering the mighty mountain and the goddess of the summit. Though not all sherpas are mountaineers, they display a knack for understanding parts of the mountain that most outsiders don’t. Their skills allow them to serve as exceptional guides for those hoping to summit the dangerous Himalayan peaks. Norgay got his first shot at an Everest expedition when he was just 20 years old in 1935 on an expedition led by Eric Shipton. It was by sheer chance that Norgay even went. At the last minute, two other sherpas failed their medical tests, and Norgay stepped in to replace them. Though Shipton’s team didn’t reach the summit (as it was just a reconnaissance mission), the group was ultimately successful in their endeavor. Throughout the rest of the 1930s and the early 1940s, Tenzing Norgay would accompany several more climbs up Everest, including one in 1936 by famed British mountaineer John Morris. In 1947 Norgay took part in a Swiss expedition, marking his fourth time climbing Everest. Later, he accompanied two more attempts: a U.S. expedition in 1950 and a British recon mission in 1951. Then in 1952 he accompanied yet another Swiss expedition, this time making it the highest up the mountain that anyone had gone – 28,199 feet. The next year, he made it 16 feet higher with the same Swiss team. Before he was 40, he’d climbed Everest more times than most anyone. 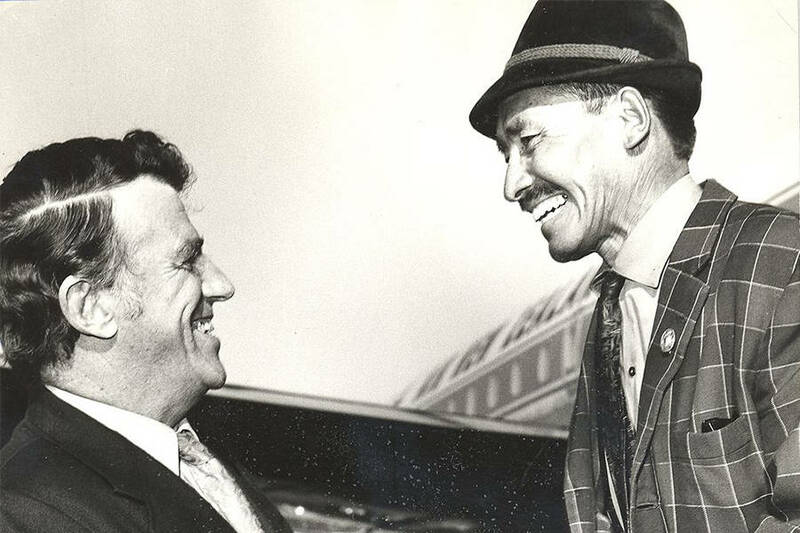 Though he considered being made an official member of the 1952 team “the highest honor,” there was still something Norgay had yet to achieve: reaching the summit. Little did he know that in just a few short months, he’d do just that. Pictorial Parade/Getty ImagesThe photo Edmund Hillary took of sherpa Tenzing Norgay holding his ice axe at the summit of Mt. Everest, Nepal. 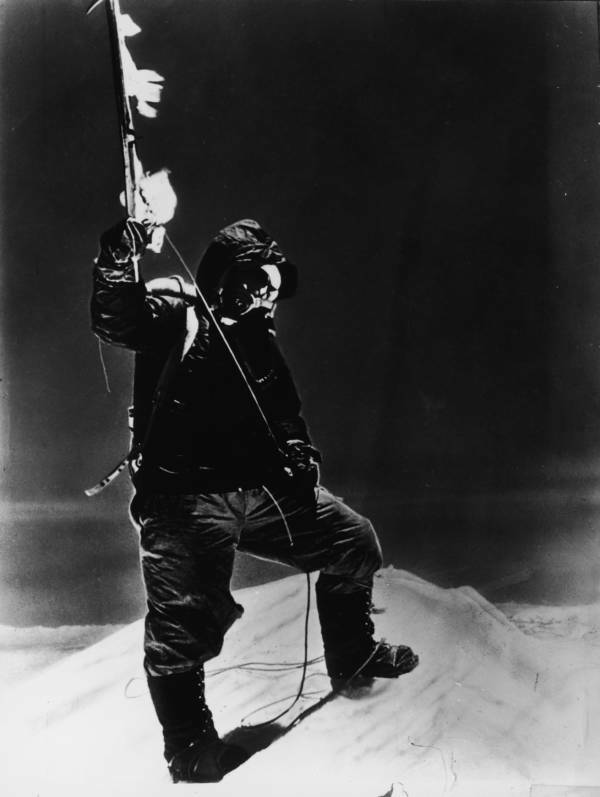 In 1953, British Army Colonel John Hunt organized the ninth mountaineering expedition to attempt to summit Everest. Despite the fact Eric Shipton had been the top pick for the endeavor, Hunt was given the job due to his military leadership. This was going to be successful come hell or high water. Though the expedition’s two most famous members would become Tenzing Norgay and New Zealander Edmund Hillary, there were actually 400 people present on the climb; 382 of them porters and sherpa guides, not to mention 10,000 pounds of luggage. During the early stages of their climb, Hillary fell while scaling a wall and nearly fell into a crevasse. Norgay, trained by his years scaling the Himalayas, reacted quickly and secured Hillary’s rope with his ice axe. With that, Hillary and Norgay became fast climbing partners and friends. For more than two months the Hunt expedition slowly climbed the mountain. They began by setting up base camp at the South Col, 25,000 feet up, from which smaller groups and pairs set out for the summit. After one pairs failed attempt, Hunt set Norgay and Hillary out. For such an incredible feat, the pair had few words for their experience atop the mountain. After scaling a 40-foot rock face that’s now called Hillary’s Step, the pair reached the summit at 11:30 a.m. They spent about 15 minutes at the top before heading back down. 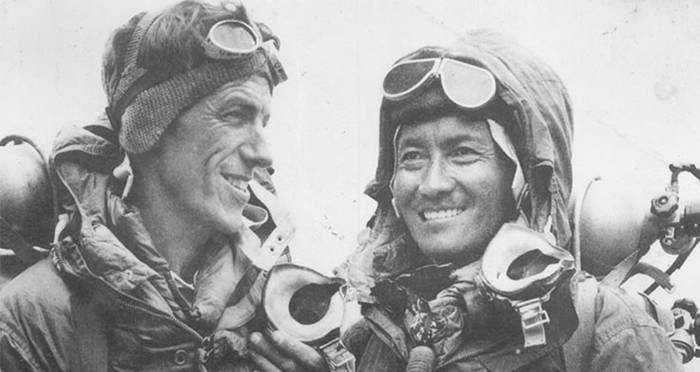 Wikimedia CommonsEdmund Hillary and Tenzing Norgay greet each other, still friendly years after their climb in 1971. “A few more whacks of the ice axe in the firm snow, and we stood on top,” Hillary said of getting from base camp to the summit. Once they reached the top, Hillary posed Norgay for a photo with his ice-axe, but refused a photo himself. Photos were taken of the mountain from the top looking down to authenticate their climb, and then they were done. Though the two of them had set foot on the summit together, the press seemed determined to put forth a winner and name the true “first man” to set foot on Everest’s summit. For years, the media depicted Hillary as the first man with Norgay nothing more than a guide. Hillary was knighted by the Queen, while Norgay was given a medal. In his home country of Nepal, he was given several awards, as well as in the surrounding Himalayan countries of India and Nepal. Climbers of Mount Everest today see more signs that Hillary wasn’t alone. Sixty years after the climb, in 2013, Norgay was awarded his own formation just as Hillary had before him. Now along the Himalayan ridge, lies a 7,916-foot face known as Tenzing Peak. While the rest of the world was a little behind in giving Tenzing Norgay his due, Colonel Hunt certainly wasn’t. From the moment he was asked who reached the summit first he’d give the same answer. Next, check out the story of David Sharp, who died on Everest while 40 people passed him by. Then, check out Yuichiro Miura, who broke the Everest record for the oldest climber – twice.